Trading stocks, or any other market, is fraught with danger. Traders can use too much leverage, be undercapitalized, trade without stops or do any number of stupid things. The biggest mistake made by new stock traders is trying to make money. That’s right—I’ll say it again: The biggest mistake made by new stock traders is trying to make money. Well, it is. But only after you have learned how to lose money. The indisputable key to stock trading success, or success in any other market for that matter, is the ability to take losses and manage risk. Without this ability and discipline, your trading career is likely to be very, very short. The most important thing for new stock traders to focus on is not losing money. And just to clarify, losing money is fine and is a big part of trading. Taking big losses, however, is not fine and will lead to account ruin. A profitable trading endeavor can only be achieved once you are proficient in risk management. This means learning to lose like a professional. This statement says a lot. It also alludes to one of the primary rules of trading: Let winners run and cut losses short. Focus your efforts on not losing money, and profits may potentially take care of themselves. 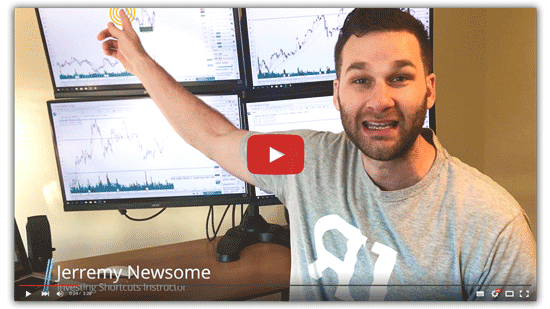 Looking for a proven, repeatable way to make easy, higher-potential trades? Get our shortcuts delivered daily to your inbox. Your Charts of the Week Update – FAANG Stocks! Jeremy Blossom has been building ideas to grow businesses for more than 15 years. For over a decade Jeremy was active in the financial industry and his understanding of the financial sector is vast and deep. Under his leadership, he delivers result-focused strategies and executions that are designed to do one thing: make clients more profitable. What is an Investing Shortcut? Investing Shortcuts are tips, tricks, and tools to help you become a better investor, and save you time and money. Our team of expert contributors is excited to share its experience and advice to help you invest smarter. © 2019 Investing Shortcuts. Investing and trading stocks, futures, options on futures, stock and stock options involves a substantial degree of risk and may not be suitable for all investors. Past performance is not necessarily indicative of future results. The information provided by Investing Shortcuts is for education purposes only and is not a recommendation buy or sell any security.